We have partnered with super Veg box company Abel & Cole to give you a very special offer! Abel & Cole is offering all Girl Meets Dress customers a copy of the Abel & Cole Veg Box Companion cookbook with your first delivery, your fourth box plus a bottle of organic Prosecco free with your fourth delivery. A weekly veg box is a rare thing because it’s a healthy habit that actually makes your life easier. You do your thing and all these fantastic vegetables wait at home so you don’t have to. Abel & Cole was started with a bag of potatoes and a smile by Keith Abel 26 years ago. Their boxes are now better than they’ve ever been and you can exclude things you don’t like or need. They work directly with the best family farmers and makers who believe, like us, that food doesn’t need weird stuff added to it to make it safe, fresh and delicious. They only use packaging when we have to, and they never airfreight. 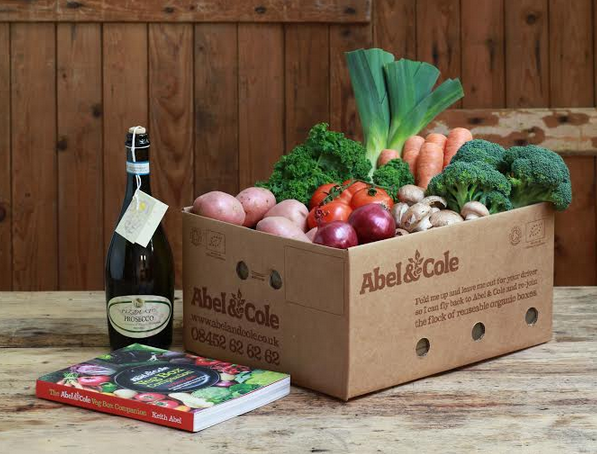 Offer – Abel & Cole is offering all Girl Meets Dress customers a copy of the Abel & Cole Veg Box Companion cookbook with your first delivery, your fourth box plus a bottle of organic Prosecco free with your fourth delivery. This offer is valid until 31st May. Promotion is valid for new Abel & Cole customers only. Abel & Cole do not deliver to the whole of the UK, please visit abelandcole.co.uk to check that they deliver to your postcode. Offer cannot be used in conjunction with any other offer or promotion. Minimum order is £12.50. Offer is available on any Abel & Cole set boxes. The discount will be added to your account automatically the day before delivery. Abel & Cole boxes are charged for after each delivery. Delivery is charged at 99p. Posted April 23rd, 2014 in Partner.